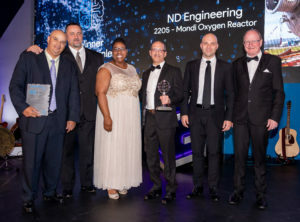 Securing an order to fabricate, deliver and install a massive Duplex SAF 2205 Oxygen Reactor column in one piece for client Mondi, ND Engineering demonstrated their ability to win against stiff international competitors and ensure the local industry benefited from the work. 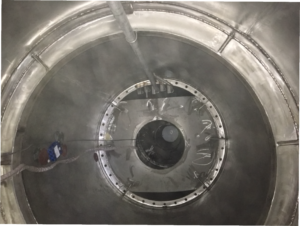 Operating within the project’s logistical, safety and installation challenges in a live plant, ND Engineering delivered a high quality product, featuring exceptional welding and an excellent finish achieved after pickling and passivation, together with quality corrosion protection coatings. Pre-manufactured shells and components were followed by final assembly and the raising of the column to fit a multitude of platforms, pipe supports and cat ladders. This was achieved with the design of specialised transport saddles, specifically devised for this column-to-trailer combination. The entire vessel was set up on one of two sets of 180 ton tank rotators, to facilitate down hand welding on the circumferential welds and ancillary attachments. The ability to rotate the entire column after completion provided the welders with the optimum positions for each weld run. 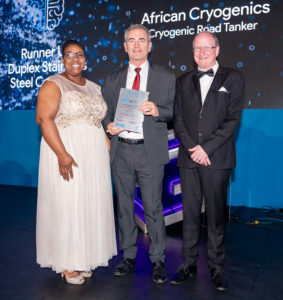 Duplex stainless steel strikes the perfect balance between flexibility and strength, according to African Cryogenics, and is extremely effective for payload optimisation in the manufacture of chassis and support structures for their Cryogenic Road Tankers. 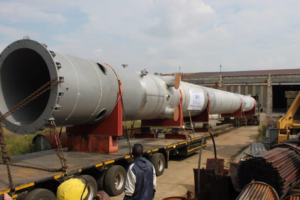 African Cryogenics utilise six tons of duplex stainless steel in the manufacture of each road tanker, with the inner vessel and chassis taking approximately 1.2 tons resulting in significant payload benefits, especially that of strength and ductility within the support structure. With a chassis design optimised for flexibility and fatigue resistance, and structurally able to withstand double the ADR requirements, Duplex delivers a better payload and the best balance on flexibility and strength. Solar PriMeg’s vision of using advanced technologies to achieve optimal functionality and quality, while ensuring their customers contribute to a greener planet, has seen the development of their 300lts stainless steel Solar Water Heater Tank. The company moved to stainless steel in 2005, with the introduction of ferritics from Columbus. 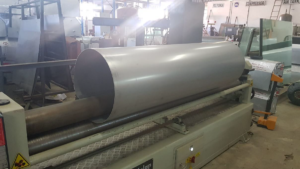 However, the change brought its own set of challenge as they faced criticism from the local industry and scepticism from clients whom had used copper and mild steel units previously. 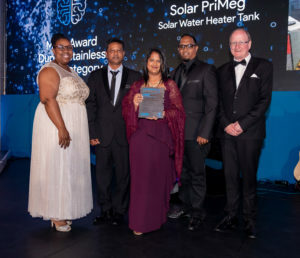 Fortunately, with the assistance of Columbus and Sassda, Solar PriMeg was able to improve and learn from previous mistakes and have more than met the challenge to deliver product quality excellence with their 2205 duplex solution as the most durable solar water heater. 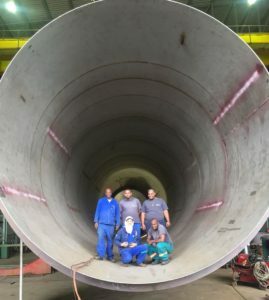 Meeting the challenges of growth in the export market into the mining sector in the Democratic Republic of Congo, together with the high cost of logistics, Vessel Fab’s innovative design team developed the concept of supplying pressure vessels in ‘kit’ form for erection on site. 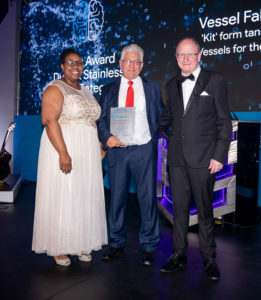 This unique design concept has enabled Vessel Fab to grow their business significantly, leading to more than 900 tons of ‘kit’ form vessels, made from LDX 2101, being exported to the DRC.